Born March 1st 1837 at Deventer, Holland. Began flute studies in Cologne, later moving to Leipzig to study his instrument with Hanke for whom he acted as deputy at the Leipzig Opera House. He was a member of Jullien’s Band in the early 1850’s before his appointment as principal flute under Charles Hallé in 1858. By 1870 he had set up his own Saturday Popular Concerts in Manchester with an orchestra of sixty players. 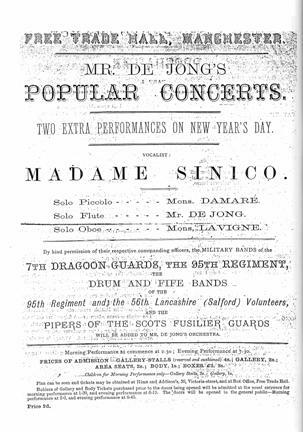 De Jong appeared as soloist and conductor. His conducting career took him to regular appointments at Buxton, Liverpool and Morecambe. 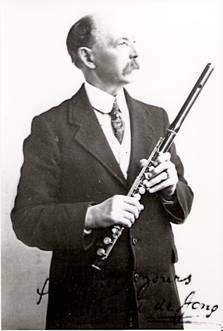 He was Flute Professor at the Royal Manchester College of Music 1893 – 1906.